Dimethicone, Dimethicone Cross Polymer, Silica, Isododecane, Aluminum Hydroxide, CI 77491/Iron Oxides, CI 77891/Titanium Dioxide, Disodium Stearoyl Glutamate F.I.L. B158823/1, 695771 15. 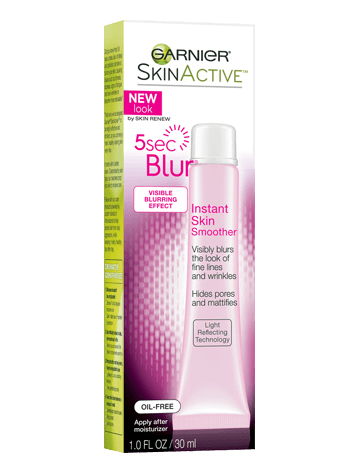 Rated 5 out of 5 by NC59 from Bring it Back - Works Great I've tried several different "blurring" products and this beats them all. It's light and non-greasy. I quit wearing any face makeup or powders. Turning 60 soon and it's a shame I have to find something different now. Doubt I will look in the Garnier line for a substitute - just because I feel so strongly about them discontinuing this one. Rated 5 out of 5 by LisaDawn from Amazzzzing !!! This is the only product that soothes hydrates and keeps me from rubbing my eyes. So so disappointed it’s no longer available. Rated 5 out of 5 by Moni2396 from Great at hiding wrinkles I was so happy with this product and how quickly it worked to hide fine lines. Rated 5 out of 5 by ROCKON from Miracle smoother I have used this product for years. I went to get more and no way i could find it. I am very upset its discontinued. I looked and tried so many other products before i found this one that really works. Please bring it back. I am 70 years of age, its kept my skin feeling & looking its best. I dont want to start all over to find a new one. Rated 5 out of 5 by HmmAmy from why was this discontinued? skin is softer and smother after application! I wish I had bought extra tubes as it really does the job for me. Rated 5 out of 5 by Bobbi22 from Best blurring product ever I used this product until it was discontinued. It was the absolute best at blurring fine lines and imperfections. This was the only product I have found that actually made it to where I didn't even want to put on makeup after using because it didnt look like I needed it. Please bring it back! I still have not found anything even close to it. Rated 5 out of 5 by ML 70 from I love this! I've used this for a number of years now, and I love it. Rated 5 out of 5 by Clk60 from Great feel and look. I love this product. Why was it discontinued? Please bring it back!